Presiding Justice Manella was born in Los Angeles, where she attended public schools before graduating from Wellesley College with high honors. She received her law degree from the University of Southern California, Order of the Coif, and was an editor of the Law Review. Following a clerkship on the U.S. Court of Appeals for the Fifth Circuit, she served as legal counsel to the U.S. Senate Judiciary Subcommittee on the Constitution in Washington, D.C., before joining O'Melveny & Myers, where she practiced complex civil litigation in Washington, D.C. and Los Angeles. In 1982, she became a federal prosecutor in Los Angeles. For the next eight years she prosecuted crimes ranging from bank robbery and murder to commodities fraud and international narcotics trafficking. As Chief of Appeals, she supervised all criminal appellate litigation in the United States Attorney's Office. In 1990, Governor Deukmejian appointed Justice Manella to the Los Angeles Municipal Court. The following year, she was selected to sit pro tem on the California Court of Appeal. In 1992, Governor Wilson elevated her to the Los Angeles Superior Court, where she presided over felony trials. In 1994, she was nominated by President Clinton to be the United States Attorney for the Central District of California. For five years she served as the chief federal law enforcement officer for the nation's largest district, administering an office of over 240 lawyers in criminal and civil litigation throughout southern California. She was the 1995 recipient of the Women Lawyers of Los Angeles Ernestine Stahlhut Award for her "significant contributions to the cause of justice." While serving as U.S. Attorney, Justice Manella was named by the National Law Journal as one of “The 50 Most Influential Women Lawyers in the United States." In a Daily Journal survey of California lawyers, she was voted among “The 100 Most Powerful Lawyers in California." In 1998, she was nominated by President Clinton and unanimously confirmed by the U.S. Senate as a United States District Judge. For over seven years she served as a federal trial judge, presiding over hundreds of civil and criminal cases. In 1999, she sat by designation on the U.S. Court of Appeals for the Ninth Circuit. 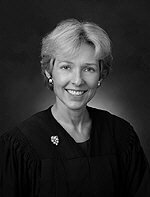 In 2000, she was named "Federal Judge of the Year" by the Century City Bar Association, Criminal Section, and received the Wellesley College Alumna Achievement Award. In 2006, she was appointed by Governor Schwarzenegger to the California Court of Appeal. She was unanimously confirmed by the Commission on Judicial Appointments, after receiving an "exceptionally well qualified" rating from the Judicial Nominees Evaluation Commission. In 2014, she received the Los Angeles County Bar Association Criminal Justice Section’s Career Achievement Award. In 2018, Justice Manella was appointed by Governor Brown to be Presiding Justice. After receiving an “exceptionally well qualified” rating from the Judicial Nominees Evaluation Commission, she was unanimously confirmed.